Hunt County Public Art is excited to announce a new large-scale art project coming to Greenville this year. 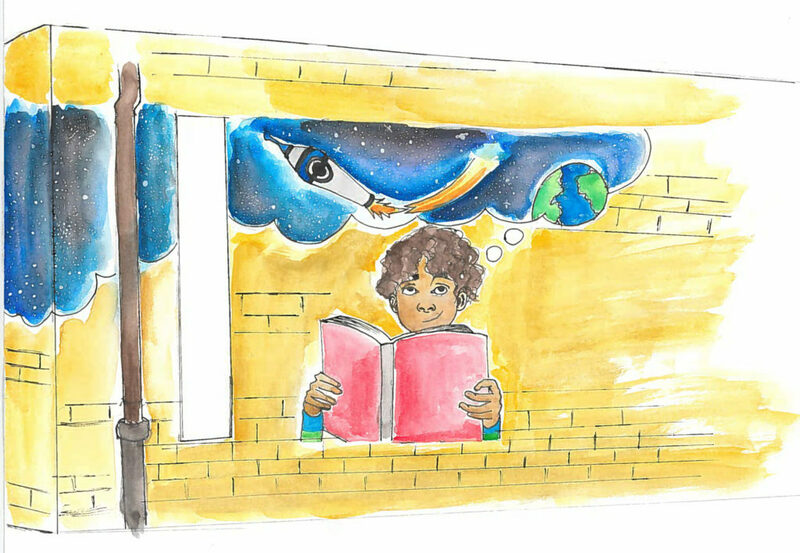 “The Sky’s The Limit,” a colorful mural by local artist Elisa Lane, will be installed on the L.P. Waters Early Childhood Center, which is located on Carver Street and can be seen from the busy Lee Street entrance to downtown Greenville. 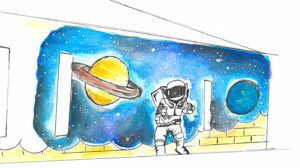 The mural has a whimsical, child-friendly theme about reading and space exploration. Derek Price, one of the art group’s founders, said he was thrilled about the high-profile location for the project. For members of the art group, the idea behind the project runs much deeper than a picture on a wall. The L.P. Waters campus serves hundreds of pre-school-age students who could be inspired by the art, said Kim Coker, chairperson for the upcoming Hearts for the Arts Gala that raises money for the project. The artist behind the project, Greenville resident Elisa Lane, had children in mind from the beginning. “Little kids have the most active imaginations and can make things appear so real while playing pretend,” she said. For Sebastian Bozas, the principal at L.P. Waters who presented the art idea to Hunt County Public Art in the summer of 2017, the project has a twofold mission. One is beautifying the western part of Lee Street, the first impression many visitors see when they arrive in Greenville on U.S. Highway 380. The principal also sees the artwork as a source of inspiration for his students and the city as a whole. People who want to support the artwork installation at L.P. Waters can do so at the Hearts for the Arts Gala fund-raiser on Feb. 10 at the Emerald Ballroom in downtown Greenville. Gala tickets are available for $50 at HuntCountyPublicArt.com, or $60 the day of the event. Tickets are also available at the Greenville Chamber of Commerce, Landon Winery, Alliance Bank main branch in Greenville and the Magnuson Hotel in Commerce.